Bringing together ultra fast scanning technologies with high sensitivity pushes the limits of what we can see. The LCMS-8060 is built for high data quality and drives confidence and consistency 24/7. 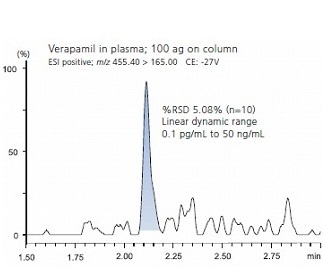 The triple quadrupole LCMS-8060 has an advanced ion guide design to increase ion production and detection and makes a meaningful impact on high sensitivity detection. 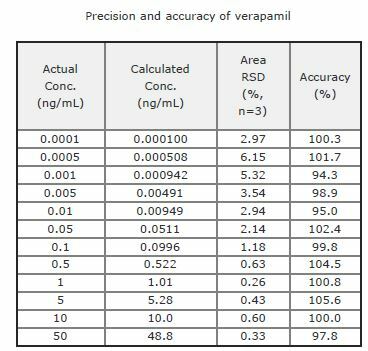 Verapamil spiked into a plasma crash sample can be quantified at 100 ag on column with a precision of 5.08% for multiple injections (n=10). 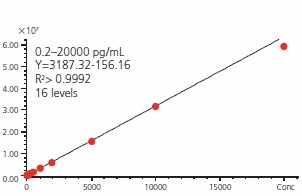 The LCMS-8060 also delivers a linear dynamic range from 0.1 pg/mL to 50 ng/mL. 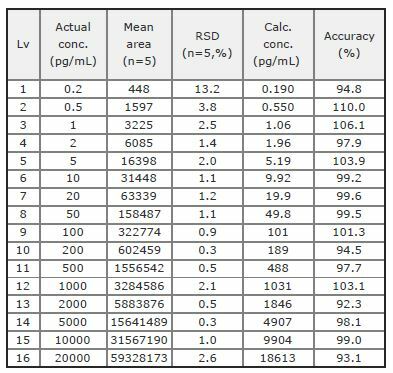 Aldosterone was detected at a lower concentration of 0.2 pg/mL using neat standards and the calibration curve was linear from 0.2 to 20,000 pg/mL.